NES Cross Fire (JPN) in 05:52.5 by MESHUGGAH. 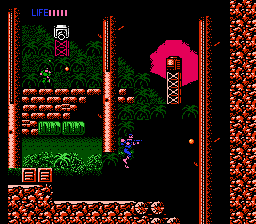 Cross Fire is a 2D Platformer game, developed and published by Kyugo Boueki, which was released in Japan in 1990. It has gameplay somewhat reminiscent of the Contra series, as you control Eric the soldier on his quest to fight evil all over the world. The player begins armed with grenades and their trusty fists, but soon receives a sub-machine gun to help mow down their enemies. In this run however, MESHUGGAH ignores its intended purpose and instead uses the machine gun to hover, pass through walls, and even skip boss fights entirely. Assisted by the world's most determined helicopter pilot, the game is completed in just under 6 minutes.